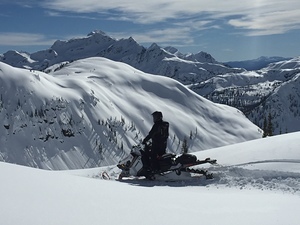 Mike Wiegele Helicopter Skiing was founded in 1970 by Mike Wiegele and is located in Blue River, BC - the heart of the Cariboo and Monashee Mountains and one of the world’s most productive regions for high quality, reliable powder snow. With more than 1.2 million acres of terrain and over 1,000 peaks, Mike Wiegele’s ski terrain offers world class skiing and boarding from high alpine glaciers to gladed mountain foests. Though famous for the ski terrain, the Heli Village Resort offers world class accommodations, dining, service, and amentities. The Resort includes a 5,000 sq foot Main Lodge, Fitness Centre, Massage, Sanua, Hot Tub, full-service Sport Shop, and Guides Haus. The heli ski season runs from early December to mid April. 50km north of the main Heli Village Resort is the Albreda Lodge. This lodge provides the ultimate in mountain luxury for up to 20 guests. Over the 40 years of operation, the resort has been an industry leader in safety procedures and protocol, guide training, and rescue response planning. They actively participate in the setting of industry safety standards and continuously research and improve accident loss prevention and safety program. Mike Wiegele Helicopter Skiing takes every measure possible to place safety as the #1 focus for all guests and staff.